If you want an idea of what busy is like, start a travel and lifestyle blog and be a single mom to a six year old boy. Needless to say, I’m always on the move. While we may not have the most ‘normal’ life, we like to do normal stuff at home (you know, bake cookies, make stuff, play games)… Building on these memories is just as important as the memories we build on top of mountains in Norway or ziplining through the jungle in Mexico. The problem is, sometimes I am at a loss of fun and creative things to do at home between our travels. Like many other moms I have a stash of arts and crafts and I’m always looking for fun ways to use them in a pinterest frenzy of DIY projects for kids. Still, this takes time, shopping for items I don’t have and then of course there’s the actual creating and cleaning. The whole thing can really take a chunk out of a busy schedule. So how can I get the home enrichment in without spending hours trying to figure out the right project, shopping and cleaning? When the ‘We Made it’ publicist asked me to check out Jennifer Garner’s new line I was so into it. I saw the video (below) of Jennifer’s product sizzle and right away was like “heck to the yes!” I checked out the different kits online which are sold exclusively at Jo-Ann Fabric and Craft Stores and I was blown away. It’s a total crowd pleaser! And part of the proceeds goes to the Save the Children Foundation! Like how awesome is that! The new line also has a range of $2.99-$49.99 so there’s something for every budget! Don’t forget to sign up for text discounts, coupons and specials from JoAnn and remember they take competitor coupons! We Made it sent us a few different kits to play with (which we’ll be featuring one by one over the coming weeks). We started with the fairy costume. And since I’m too big for it and my son is well… a son, we invited his neighbor Isabella over to help us with this fun YouTube video on Kid Friendly (the Little’s new YouTube channel). The kids LOVED putting this together. We had so much fun, everyone was laughing, it was awesome. The materials were high quality and the whole project turned out really nice. I love Jennifer’s message and how special this line is to her. It’s not about making a bazillion dollars, this is more than that and I support that 100%. Thank you Jennifer for making this totally no brainer line of cute, fun, and crafty things to do with your kids! 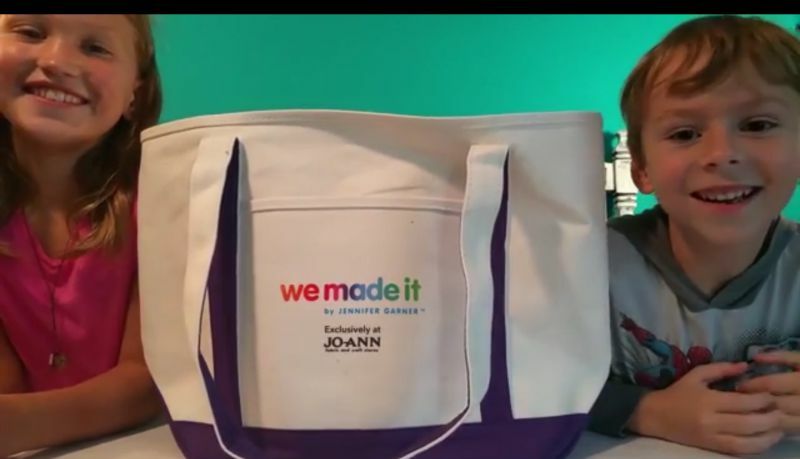 A special thank you to Jo-Ann Fabrics and Jennifer Garner for sending these kits out. While we did not pay for the kits, it in no way shapes our personal experience of the product. Don’t miss the next review! Subscribe and never miss another post! Do you have a favorite craft you like to do with your kids?